Carrigaline Whiskey Pie: A Dessert Filled with Irish Flavors! Carrigaline Whiskey Pie: A Delicious Dessert Filled with Recognizable Irish Flavors! This Carrigaline Whiskey Pie recipe is a delicious example of Irish culinary creativity, combining potatoes, eggs, Irish whiskey and heavy whipped cream. We got our recipe from a friend several years ago, and prepared it for a St Patricks Day party, receiving rave reviews! It's a delightful, surprisingly rich dessert that hearkens back to traditional life in the countryside. If you would like more delicious Irish dessert recipes, pay a visit to our main Irish desserts section here. 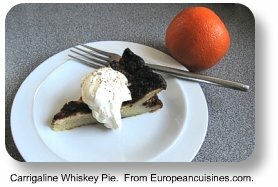 Meanwhile, pleas eenjoy our favorite Carrigaline Whiskey Pie recipe! Preheat oven to 375 degrees Fahrenheit. Butter and flour a 9-inch springform pan, then line the bottom with buttered baking parchment/bakery paper. Beat the egg yolks in a large bowl. Gradually blend in the sugar and beat until fluffy. Add the mashed potatoes. After the potatoes are completely blended into the egg-sugar mixture, add the orange extract, pounded almonds, melted butter and whiskey. Mix well and set aside. Beat the egg whites until stiff. Fold them into the egg yolk mixture in your large bowl. Pour the mixture into the prepared springform pan. Quickly but gently place the pan in the pre-heated oven. This is a type of soufflé, so close the oven door slowly, avoiding any jarring vibrations which could make the pie collapse. Bake at 375 degrees Fahrenheit for 40 to 45 minutes, then gently remove from the oven and set aside to cool. It will fall right away (it’s a soufflé and is meant to collapse). Serve at room temperature or after being chilled overnight, topped by a healthy dollop of unsweetened heavy whipped cream. A sprinkle of nutmeg on top adds additional flavor.